Morrie Rath’s life could have been a Hollywood movie – the type of movie where the lead character keeps getting back up after getting knocked down. And for Rath’s movie, the final scene would have played out on October 1, 1919, during the first game of the infamous 1919 World Series. On the biggest stage in all of sports at the time, Rath, twice kicked to the curb by major-league teams, given up by many teams as a career minor leaguer, was leading off the game for the Cincinnati Reds. His was a remarkable story. Serving in the Navy during World War I, he hadn’t even played in Organized Ball in 1918 but had made the Cincinnati Reds on the strength of his 1917 season with Salt Lake City of the Pacific Coast League. Not only had he become the Reds’ everyday second baseman but he had helped lead the team to the National League pennant. His season was a big reason the Reds faced the powerful Chicago White Sox in the fall classic. So as Rath dug in against 29-game-winner Eddie Cicotte, he was determined to make good. Little did he know that he would become part of a bigger story, for Cicotte, who was possessed of pinpoint control throughout his wonderful season, plunked Rath with the second pitch of the game. Only a select few knew it was the first sign that Cicotte was involved in a scheme to throw the World Series. With the pitch, Rath’s place in a Hollywood movie was cemented but instead of starring, he’d have a bit role. Rath’s story was so much more than one at-bat. The son of a Wild West legend and a woman less than half his father's age, Rath moved quickly from high-school ball to the major leagues. But he never stuck for very long in the big leagues. In his first season, with the Philadelphia Athletics, he found his path to the starting lineup blocked by Frank “Home Run” Baker, a future Hall of Famer. 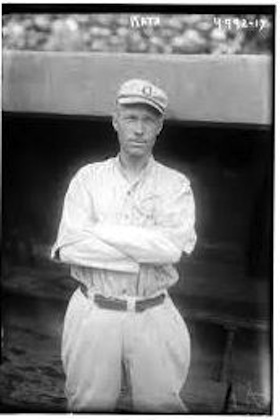 Connie Mack, looking for some outfield help, traded him away along with the rights to Joe Jackson. A severe head injury diving into the shallow end of a pool during spring training probably contributed to Rath’s eventual demotion another season. Incredibly, he played against his nephew in the major leagues but may have never known it. And when illness plagued him in his late 50s, he took his own life. When tensions became tight between the Cheyenne and white settlers, Charles Rath was forced to flee and leave his family behind. Rath moved on with his life and took a legal (at least in the eyes of the US government) wife, Caroline Markley. The marriage produced three children (two of whom lived into adulthood). During this time, Rath’s businesses prospered throughout the Southwest. He made his home in Dodge City, Kansas, but also had a base of operations in Mobeetie, Texas, and Albuquerque, New Mexico. Despite the slump, Rath had in many ways a better season than in 1919. He led National League second basemen in fielding percentage. His batting average was higher in 1920 than in 1919. But Rath walked significantly less in 1920, and as a result his on-base percentage was lower. In December 1920 rumors started that manager Pat Moran was looking to replace Rath at second. The couple had no children. Rath was buried in Arlington Cemetery in Drexel Hill, a section of Upper Darby. 1 Bill James, The New Bill James Historical Abstract (New York: Simon and Schuster, 2010), 534. 2 Marc Simmons, Kit Carson and His Three Wives: A Family History (Albuquerque: University of New Mexico Press, 2003), 45-46. Making Out Road also was known as Road Maker. It’s unclear whether Balenti and Rath, who were contemporaries, knew that they were related. Balenti, who was five months older than Rath, grew up on an Indian reservation in Oklahoma. 3 Kathy Weiser, “Old West Legends. Charles Rath, Buffalo Entrepreneur,” Legends of America, . legendsofamerica.com/we-charlesrath.html, accessed May 29, 2014; Ida Rath, “The Rath Trail,” kancoll.org/books/rath/, accessed May 29, 2014. 4 Philadelphia Inquirer, November 7 and December 15, 1906, January 20 and April 6, 1907, and February 27, 1908. 5 Philadelphia Inquirer, October 19 and 20, 1907, and February 27 and March 8, 1908. 6 Philadelphia Inquirer, May 23 and June 15, 1908; Charlotte Observer, August 20, 1908; Richmond Times-Dispatch, September 9, 1908. 7 Denver Post, November 30, 1912; Chris Hauser, “Al Orth” SABR Baseball Biography Project, sabr.org/bioproj/person/9ddb48e5, accessed May 29, 2014. 8 Trenton Times, January 28, 1912; Philadelphia Inquirer, June 15, 1908. 9 Harrisburg Patriot, December 24, 1908; Philadelphia Inquirer, March 21, 1909; Sporting Life, March 27, 1909; Lebanon (Pennsylvania) Daily News, April 29, 1909. 10 Philadelphia Inquirer, August 22, 1909; Trenton Times, September 7, 1909; Sporting Life, October 9, 1909. 11 Sporting Life, March 5, 1910; Williamsport (Pennsylvania) Sun-Gazette, March 15, 1910; Philadelphia Inquirer, March 9, 1910. 12 Sporting Life, August 6, 1910; Norman L. Macht, Connie Mack and the Early Years of Baseball, (Lincoln: University of Nebraska Press, 2007), 476; Cleveland Plain Dealer, July 24, 1910. 13 Sporting Life, August 13, 1910; Cleveland Plain Dealer, August 15 and 25, 1910, April 25, 1912. 14 Baltimore American, December 25, 1910. 15 Sporting Life, November 5, 1910; Baltimore American, December 25, 1910. 16 Cincinnati Post, July 24, 1911; Williamsport (Pennsylvania) Gazette and Bulletin, August 1, 1911; Jersey Journal (Jersey City) September 2, 1911; Sporting Life, September 30, 1911. 17 Trenton Times, January 28, 1912; Harrisburg Patriot, March 9, 1912; Sporting Life, March 2 and 23, 1912. 18 Baltimore Sun, April 28, 1912; Sporting Life, May 18, 1912; Bob McConnell and David Vincent, The Home Run Encyclopedia (New York: Macmillan, 1996), 1014. 19 Sporting Life, April 20 and September 7, 1912. 20 Sporting Life, September 21 and November 16, 1912; Cleveland Leader, March 9, 1913. 21 Cleveland Leader, February 19, 1913; Grand Forks (North Dakota) Herald, February 27, 1913; Salt Lake Telegram, February 25, 1913; Rockford (Illinois) Morning Star, February 26, 1913. 22 Rockford (Illinois) Morning Star, August 2, 1913; Oelwein (Iowa) Daily Register, August 14, 1913; Cleveland Plain Dealer, August 23, 1913; Kansas City Star, August 30, 1913. 23 Oakland Tribune, November 12, 1913; Duluth (Minnesota) News-Tribune, December 1, 1913; James E. Elfers, The Tour to End All Tours (Lincoln: University of Nebraska Press, 2003), 96. 24 Sporting Life, December 13, 1912, and October 24 and December 12, 1914; Philadelphia Inquirer, December 20, 1914. 25 Kansas City Star, June 13, 1915; Sporting Life, June 19, 1915; Salt Lake Telegram, November 3, 1915. 26 Salt Lake Telegram, November 3, 1915, and January 20, 1916. 27 Sporting Life, April 1 and May 13, 1916; Salt Lake Telegram, April 15 and May 13, 1916. 28 The Oregonian (Portland), September 27, 1949; Salt Lake Telegram, September 21, 1917. 29 Cincinnati Post, December 12, 1917; Canton (Ohio) Repository, January 9, 1918; Kansas City Star, February 6, 1918. 30 Philadelphia Inquirer, May 19 and 27, 1918. 31 Philadelphia Inquirer, May 27, 1918. 32 Philadelphia Inquirer, October 6, 1918. 33 Salt Lake Tribune, December 12, 1918; Pueblo (Colorado) Chieftain, March 20, 1919. 34 Cincinnati Post, March 20, 1919; Kansas City Star, April 8, 1919. 35 Cincinnati Post, June 26 and July 17, 1919; Lima (Ohio) News, August 18, 1957. 36 New Orleans Items, September 20, 1919. 37 Cincinnati Post, September 19 and October 11, 1919. 38 Miami Herald, January 3, 1920; Cincinnati Post, March 11, March 27, April 22, and July 19, 1920; LeGrand (Iowa) Reporter, June 4, 1920; Anaconda (Montana) Standard, September 12, 1920. 39 Cincinnati Post, December 14, 1920, and January 4, 1921; New Orleans States, January 4, 1921; Seattle Times, January 7, 1921; Salt Lake Telegram, January 5, 1921; Lexington (Kentucky) Herald, January 5, 1921. 40 Tampa Tribune, January 25, 1921; The Oregonian (Portland), February 21 and 22, 1921. 41 Oakland Tribune, May 14, 1921; Cleveland Plain Dealer, August 14, 1921; Flint (Michigan) Journal, December 14, 1921. 42 Baltimore Sun, January 5, 1922; Philadelphia Inquirer, May 26, June 22, and July 23, 1922; Chester (Pennsylvania) Times, May 17, 1939, and November 19, 1945; Trenton (New Jersey) Evening Times, April 27, 1923. 43 Dallas Morning News, September 11, 1939; Canton (Ohio) Repository, October 2, 1940; Chester (Pennsylvania) Times, November 19, 1945.